These instruments meet the demands of all players who left the beginners state. While you ask for a student instrument no more than a pleasant sound an good respond, you now add the possibility to express yourself to your wish list. 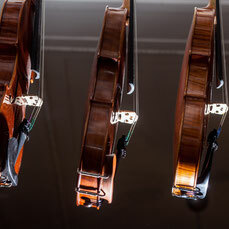 We offer a wide range of violins, violas and cellos to meet your demands. You are very welcome to visit us for a viewing appointment (0228/ 657 857). The world really does need instruments like that: Beautifully built with wonderful sound while still not too expensive. Very popular among talented teenage players who like to take part in competitions. Viola: new viola finished in our workshop. 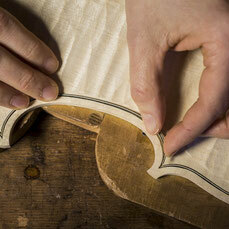 All parts of a viola do affect the sound, but some more than others. The most important part for the sound of stringed instruments is the arching and thiknessing the front and the shape of the back. That is why we do these steps ourselves. The less important parts like scroll an ribstructur come from good serial production in the south of Germany. 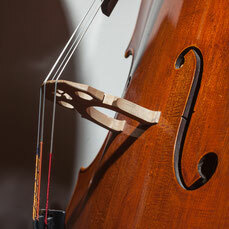 Cello: approximately 100 years old, built in Mirecourt, France. We always offer a wide range of antique instruments. Mostly violins, but some cellos and violas as well. These instruments were restored in our workshop and completed with an excellent sound adjustment. Antique instruments within an acceptable price range usually can not be related to a particular violin maker. However, they do have there special charm in sound in looks.